Inevitably, given the uniformity of casting, much of what I had to say in my reviews of the Krauss Ring here (review ~ review) applies to this one; the main differences obviously lie in the conducting and the relative merits of Varnay’s and Mődl’s Brünnhildes. Keilberth is steadier and weightier than Krauss’ more febrile, stop-go approach and at times a bit dull, but I quibble. His timings are in fact overall similar to Krauss’ in the first three evenings, but he is rather more leisurely in Götterdämmerung. Indeed, the first Act of Die Walküre delivers everything you could desire from that greatest passage in the entire Ring: pounding tension, beautiful singing from three great voices and rapturous string playing. Keilberth gives Vinay and Resnik ample time to fill their grateful phrases with ample tone but generates fist-pumping, air-punching excitement at its climax. This is just where Krauss fails and presides over the one weak spot in his direction of the work. We hear Mődl’s Brünnhilde for the first time at the opening of Act 2; she has a powerful voice with a strangely grainy, throaty timbre and a catch in it that makes it very individual and instantly recognisable. Hotter and Malaniuk make a fine warring couple, their vivid word-painting adding real edge to their argument. There is no denying that for some Act 2 has its longueurs, but with the six voices here you will not hear it performed better, with the possible of Leinsdorf’s magnificent 1961 studio recording. The last Act is a triumph, the occasional sour tuning in the woodwind notwithstanding. Mődl is intensely moving in her plea for a more dignifies punishment and Wotan’s “Leb`wohl, du kühnes, herrliches Kind” gives me goose bumps; the combination of trembling emotion and vocal strength in Hotter’s voice is irresistible. I could wish for the Magic Fire Music to be played at more of a trot, but it has massive dignity and sonority. Siegfried invariably presents the greatest challenge in any cycle and Windgassen’s first stab at the eponymous title role is not without its accidents and he gets completely lost for a while in “Zu neuen Taten” in Gotterdammerung but it’s a brave assumption by a singer who was never really the complete Heldentenor but husbanded then selectively applied his vocal resources very intelligently. His tone whines and he sometimes resorts to a guttural sound for emphasis but manages the Forging Scene without fading or ducking notes, even if he is rhythmically uncertain. It’s a pity there’s a break in that scene between CDs 6 and 7, which breaks the flow, but it’s not in the worst of places. Hotter is in especially mighty voice in "Wache, Wala! Wala! Erwach!" at the start of Act 3 and in the ensuing tortured outburst in conversation with Erda; this is the legendary Wagnerian, not the faded wobbler of later years who recorded his Wotan for Solti in the 60’s. I find Mődl mesmerising in the last great, extended duet; she shirks nothing and wallops the last top C, while Windgassen rises to the occasion and keeps up with her. If you have just sat through nearly four hours of Siegfried, those ten minutes have to deliver, and, my goodness, they do here. Paul Kuën continues to portray Mime with exemplary diction and depicts his character memorably while avoiding the whining caricature we too often hear. Neidlinger and Ilosvay are once again ideal in their roles and Rita Streich makes an attractive Woodbird, trilling neatly and charmingly. Joseph Greindl underpins the whole cycle with his assumption of three bass roles of Fafner, Hunding and Hagen; he is sometimes a little clumsy and even rocky, but what a big, black, menacing noise he makes – ideal for portraying all three brutes. It’s a pity that in his final death-scene he is placed so far back from the microphone. Gőtterdämmerung is even longer than its predecessor but is more varied in content, and if vocal quality helps it slip by, then Keilberth’s Ring has every advantage. Canny deployment of already available personnel means that we have three Norns of extraordinary pedigree: the singers who impersonate Erda, Fricka and Sieglinde transform themselves into the three Weird Sisters. Once Windgassen has got his mistake over and done with, his opening duet with Mődl is as thrilling as was the closing one in Siegfried, providing a sense of dramatic continuity. “Siegfried’s Rhine Journey” is so energised that sometimes the audience even stop coughing long enough to listen to several uninterrupted bars but as soon as Gunther and Hagen appear, its tuberculosis as usual. One wonders how the Gutrune slipped past quality control to get a job in such distinguished company, as she is as much of a blot on Keilberth’s Gőtterdämmerung as she was on Krauss’ the following month, but we must live with it. It’s a pleasure to hear Hermann Uhde as Gunther, even if he sounds rather too virile for that craven personage. The crucial oath-swearing trio concluding Act 2, is scintillating. The final Act is splendid; Mődl proves to be quite the equal of any other Brünnhilde, attacking her top Bs and B flats fearlessly and Keilberth drives his orchestra to a wholly satisfying apotheosis. 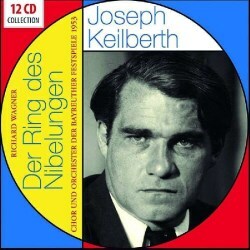 Of course, you can hear Keilberth’s Bayreuth Ring from 1955 in live composite recordings in stereo on the Testament label, but again, you will pay a great deal more for that privilege than you will for this box – and the casts are very similar without necessarily being noticeably superior; Hotter, for example is just beginning to develop a bit of a wobble in 1955 which wasn’t there two years earlier. Some also find the amount of stage noise from feet and hissing machinery objectionably intrusive. Another super-bargain option is the Zyx set with Keilberth’s 1952 Bayreuth performances of the first and last operas in the tetralogy, the 1953 Siegfried reviewed here and Furtwängler’s 1954 studio recording of Die Walküre – a bit of a ragbag but well worth hearing, with many of the same Bayreuth stalwarts as in this Documents set but featuring Uhde’s Wotan, Varnay’s Brünnhilde (Mődl sang Gutrune that year) and Max Lorenz out of retirement to sing Siegfried. All in all, this is much more than an historical document and it would be extraordinarily churlish not to welcome, praise and prize a Ring of this quality and provenance so competitively priced.